On Wednesday, the Feed-In Tariff was cut for the second time this year, reducing the rate paid to households for solar-generated electricity from 21p kWh to 16p kWh. Despite the cut, industry analysts and government ministers are confident that solar technology has a bright future in Britain. In April, the Coalition was heavily criticised for reducing the Feed-In Tariff from 43.3p kWh to 21p kWh. The decision had been subject to a legal battle in the High Court, as manufacturers of solar photovoltaic panels in the UK feared an abrupt rate cut would destroy the industry. Solar survived the first round of cuts, but how might it respond to this latest reduction? 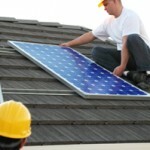 Does solar PV still offer good value for money? The Chief Executive of Solar Trade Association (STA), Paul Barwell, appears to be optimistic about the future of solar power in the UK. Mr Barwell said: “Our figures show that solar is a no-brainer investment. Compared to the returns you can get these days in banks and many other investments, solar provides a very solid and attractive return”. Mr Barwell’s comments are revealing if only because the solar industry has sought to compare the Feed-In Tariff with interest rates for savings, which have been pegged by the Bank of England for the past few years in a bid to improve the economy. Few high-street lenders are willing or able to offer high-interest rates for savers because the base rate is fixed at 0.5 per cent. Whilst 16p kWh could be interpreted as offering a better rate for customers, this is only true for as long as the manufacturing cost of solar panels continues to fall. Households will only receive a good return on investment if cheap solar panels are purchased. Furthermore, nobody can predict exactly how much solar electricity will be exported to the National Grid each month after a household has consumed what it needs. Likewise, solar irradiation cannot be accurately predicted. The Feed-In Tariff, which from Wednesday will only apply for a 20-year period (down from 25 years), may offer a better rate than savings at the moment, but the comparison is misleading. According to Tom Pakenham of Green Tomato Energy, the net return on investment for domestic installers is currently just 5 per cent over two decades. PREVIOUS POST Small energy supplier cuts energy costs, will the Big Six be next?